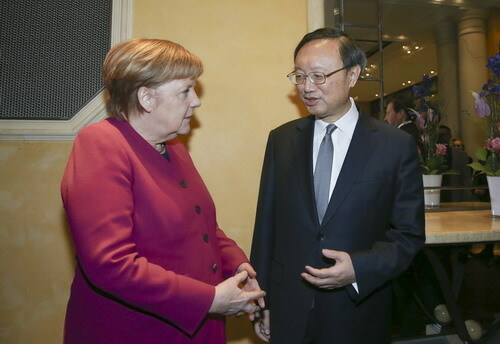 On February 16, 2019 local time, Chancellor Angela Merkel of Germany met in Munich with Member of the Political Bureau of the Central Committee of the Communist Party of China (CPC) and Director of the Office of the Foreign Affairs Commission of the CPC Central Committee Yang Jiechi, who was attending the 55th Munich Security Conference in Munich. Angela Merkel said that Germany and China are all-round strategic partners who enjoy frequent high-level exchanges, fruitful results of friendly cooperation in various fields and close coordination on international affairs. The German side has taken a positive approach towards international cooperation under the Belt and Road Initiative and is willing to strengthen communication and deepen cooperation with the Chinese side, and promote the interests of enterprises and peoples of both countries. Yang Jiechi expressed that at present, the world is in a complex situation. China and Germany, as two major countries with important influence on the Eurasian continent and major economies in the world, should maintain strategic focus and maintain sound and stable development of bilateral relations. Both sides should make the cake of common interests bigger through complementary advantages. The Chinese side welcomes the German side's active participation in the international cooperation under the Belt and Road Initiative and is ready to continue to provide a fair and transparent investment environment for foreign companies, including German companies. It is hoped that the German side will also continue to provide a fair policy environment for Chinese companies to invest and do business in Germany.